Ali ibn Abu Talib was a man who was a bit below average height, with a dark complexion, and large, dark eyes. He had a thick, wide beard on his handsome face; his teeth would appear when he smiled. Prophet Muhammad (pbuh) nicknamed him "Abu Turab" (Father of the Soil); in addition to this, he had other nicknames such as "al-Murtadha" and "Asad- Allah al-Galib". Since he did not worship idols when he was a child, he would later be called, "Karram-Allah wajhah". Virtually all sources - Sunni and Shiite alike - are in agreement that Ali had the highest status among Muslims in the era of the expansion of Islam in terms of moral and intellectual properties such as knowledge, wisdom, taqwa ("God-consciousness" or piety), sincerity, altruism, compassion, bravery and heroism, as well as being one of those who knew the Quran and the sunnah (practices of the Prophet) of the Prophet Muhammad best at that time. On the other hand, Ali was also an important figure in Islamic mysticism (tasawwuf - Sufism); for this reason, he has been respected and given a special place in Sufi literature, particularly in Turkish cultural history. In spite of all this, it is relatively difficult to know this historical figure and personality, his characteristics and his virtues well; there are many different (and conflicting) narratives about some of his activities, as well as about the speeches attributed to him and his literary writings and poems. It is certain, however, that he was a devout Muslim and faithful to the Quran and the sunnah of Prophet Muhammad, and that he wished to distance himself from worldly affairs; he was an idealist and a God-conscious believer who was very sensitive and compassionate. He was so compassionate that he shed many tears over the unfortunate events in Islamic history, such as the battles of Jamal, Siffin and Nahrawan, and he prayed to God for the salvation of his opponents. However, the Shiite world has sometimes not found such qualities adequate, although they are recognized and celebrated by the Islamic community in general; they have insisted on attributing to him the title of Imamat (leadership), which constitutes the most important and essential element of the emergence of the Shiite as a separate group within the Muslims. Some also make use of the many legends, or sometimes even hadiths - most of which are not compatible with the principal teachings of the Quran or the Sunnah. According to some, Ali ibn Abu Talib was appointed by Prophet Muhammad himself on the command of Allah to be the leader (imam) and caliph of the Muslim community (ummah), and starting from the early years of his prophethood, Prophet Muhammad had many times either indicated or implied this to his followers. However, this idea, which is shared by many Shiites, is not only incompatible with the general principles of and legal reasoning in Islam, at the same time it goes against the view of the greater majority of the Islamic ummah, as well as historical facts. Ali ibn Abu Talib is reported to have been born in Mecca twenty-two years before the Hijra (emigration to Medina in 622 AD). His father - who was the uncle of Prophet Muhammad - was Abu Talib, and his mother's name was Fatima bint Asad ibn Hashim. He was the youngest son of Abu Talib. When he was five years old, there was a famine in and around Mecca, and Prophet Muhammad took him under his custody in order to ease the burden on Ali's father; thus, he was raised by the Prophet until they migrated to the city of Medina. Ali was also one of the first to choose the Islamic faith and the message brought by Prophet Muhammad. It is a matter of debate between the Sunnis and the Shiites whether he became Muslim immediately after the wife of Prophet Muhammad, Khadijah, or at the same time as her, or after both Khadijah and Abu Bakr. There are reports that claim that at that time he was nine years old, while others state he was ten or eleven. In this case, it is more likely that he entered Islam after Khadijah, and was the first among the children to enter Islam. He was also most likely to have been the first to pray together with Prophet Muhammad. There is not much information about his life in the pre-Hijrah period. However, in the Shiite sources, which are full of legends and doubtful narratives, his life story is told in minute detail, including his childhood, which was full of miraculous deeds. When Prophet Muhammad decided to leave Mecca and migrate to Medina as a result of the intensified pressure and torture of the idol-worshippers in Mecca, who were even preparing to assassinate the Prophet, he left Ali ibn Abu Talib in his place in Mecca so that he would divert the enemies and hide the fact that the Prophet had left. After the Prophet had left Ali stayed in the Prophet's bed at night to give the impression that he was still there. Later, he delivered the things that had been entrusted to the Prophet back to their owners, and then on the order of the Prophet, he himself left Mecca (together with Fatima, the Prophet's daughter, and another Fatima, his mother) for Medina, and caught up with Prophet Muhammad, near Kuba. Five months after the Hijrah, when Prophet Muhammad had established the muakhat (brotherhood) among his followers (in order to establish solidarity and close contacts between the ansar - the Muslims of Medina - and muhajirun - the Muslims of Mecca - the immigrant Muslims), he chose Ali as his ‘brother'; he allowed him to marry his daughter Fatima in the last month of the second year of the Hijrah. With Fatima, Ali had three sons and two daughters: Hasan, Hussein and the stillborn Muhsin; the girls were Zaynab and Umm Qulthum. Until Fatima died, Ali did not marry anyone else; after her death, however, he married several times and had many children. Ali participated in virtually all gazahs (the expeditions or battles in which Prophet Muhammad personally participated) and siryas (battles which Prophet Muhammad commissioned, but did not participate in), including the battles of Badr, ‘Uhud, al-Khandaqh, and Khaybar. In the gazahs he carried Prophet Muhammad's flag. He demonstrated great heroism in the battles, which would later be narrated in a legendary manner. In the Battles of ‘Uhud and ‘Hunayn he bravely protected the Prophet despite his many injuries; in the Battle of Khaybar he used a heavy iron gate as a shield and played a very important role in the victory. Ali was also the commander of the expeditionary force against the Bani Sa'd in Fadak (6 / 628), and commanded the army in the campaign against Yemen (10 / 632). After this campaign, the Bani Hamdan tribe in Yemen collectively entered Islam. Finally, during the Tabuk ghazah, he stayed in Medina as the representative of Prophet Muhammad. Ali also served as the personal clerk and one of the ‘revelation clerks' (clerks who recorded the revelations received by Prophet Muhammad); he also was the one who wrote the Hudaybiya Treaty. Among his other services was the destruction of the idols that had previously belonged to the Aws, Khazraj, and Tay tribes, as well as demolishing the idols in the Kaaba after Mecca had been conquered by the Muslims. In the 9th year of the Hijrah (631) he was commissioned by Prophet Muhammad to go to Mina to catch up with Abu Bakr who had been appointed as the leader of the pilgrimage convoy, and to read to him the first seven verses of Sura Tawba (the 9th chapter of the Quran) that had just been revealed and were related to pilgrimage and the pagans in Mecca. He was also instructed by the Prophet to declare that as of that year, Muslims would not participate in the pilgrimage with the Meccan pagans any more, and that no one was allowed to make the circumambulation around the Kaaba naked. When Prophet Muhammad died in 632, the funeral services, such as washing and shrouding the body were carried out according to the Prophet's testament by Ali as well as by some of the other relatives of the Prophet, including ‘Abbas and the Prophet's sons Fadl, Qusham and Usama ibn Zayd. In the meantime, Muslims (both ansar and muhajirun) had gathered together in the garden of the Bani Saida to elect the new caliph. When the Prophet's closest friend, Abu Bakr, was elected as the caliph, Ali did not make bayat (the oath of allegiance) to him until his wife, Fatima, died, six months later. It has been debated between the Sunnis and the Shiites whether this was because Ali had wanted to be the caliph, or because the election of Abu Bakr had been carried out in haste. Whatever the situation was, however, Ali did not make any claim to the caliphate after Abu Bakr was elected as the first caliph. Nor did the Companions of the Prophet who had elected Abu Bakr as the caliph and took the oath of allegiance to him consider that revelation (verse or hadith) or inheritance played a factor in their election of the first caliph, contrary to what many Shiites have claimed. On the contrary, when electing Abu Bakr they considered other factors, such as their belief in his ability to maintain the order and unity of Muslims and to defend and expand the borders of the Islamic state which was already undergoing a process of development and expansion, his being a member of the Quraish tribe (of which the Prophet was also a member), his charismatic personality based on his age and experience, his being one of the first to embrace Islam, and his being the closest friend of Prophet Muhammad. In fact, Ali would later say that he had not taken the oath of allegiance to Abu Bakr in order not to further sadden his wife Fatima, who was already sick - and who would die soon. During the reign of the first three caliphs, Ali neither accepted any administrative post, nor participated in battles or expeditions - with the exception of acting as the military governor of Medina during the reign of the second caliph, Umar, when the caliph traveled to Palestine and Syria. He preferred to reside in Medina and indulge in religious sciences and meditation over other, administrative or military, offices and duties. Due to the fact that he was deeply knowledgeable about the Quran and hadith, both Abu Bakr and Umar often resorted to his opinion, particularly in matters relating to fiqh (Islamic jurisprudence). When Umar was caliph, it was Ali who suggested that the Hijrah of Prophet Muhammad from Mecca to Medina should be taken as the start of the Islamic calendar - a proposition which was then accepted. He was also a member of the assembly appointed by the second caliph, Umar, to elect a new caliph when Umar had been stabbed by a freed former slave in the year 23 (644). Although Ali, together with a group of Companions, including Talha ibn ‘Ubayd-Allah and Zubair ibn ‘Awwam, sometimes criticized some of the actions of the new caliph elected by this assembly, Uthman, he never supported the upheavals or rebellions against the caliph which took place during his reign. He criticized the caliph for some of his policies, in particular, for ignoring or not applying the principles of the Quran and the sunnah of the Prophet, and for not applying the penalties sanctioned by the Sharia. The fact that such leading Companions as Ali, Talha ibn ‘Ubayd-Allah and Zubair ibn ‘Awwam criticized the caliph in this way may have encouraged the rebels who arrived in Medina from Egypt, Basra and Kufa; they met with these Companions and even proposed that each of them be the next caliph after the possible deposition of Uthman from the caliphate. However, these three great Companions of the Prophet firmly rejected this proposition; in particular Ali made serious suggestions to the rebels and cautioned them not to continue in their rebellion. However, he was unable to prevent them from besieging the caliph's house. When the situation became worse, he sent his two sons, Hasan and Hussein, to the caliph's house as guards to protect him, and continued to show his support for him as he had been doing since the beginning. In spite of all these measures, however, Caliph Uthman was martyred by insurgents in the year 35 (656). After Uthman was martyred, all of the members of the Umayyad tribe immediately left Medina, and thus the city was completely taken over by the insurgents. Then, a group of leading Companions, including Abdullah ibn Umar, Sa'd ibn Abu Wakkas, Mughira ibn Shu'ba, Muhammad ibn Maslama and Usama ibn Zayd, came together in the mosque and tried to elect a new caliph to end the disorder that had disturbed the Muslim ummah. They elected Ali ibn Abu Talib as the new caliph, but at first he refused this post and he nominated Talha and then Zubair respectively. But when they rejected the post and all insisted that Ali take the position, he finally accepted their pledges of allegiance. There are conflicting reports in the sources about the exact date of this election. According to some sources, this event took place on the same day that Uthman was martyred (18 Dhilhijja / 17 June), while others report that it occurred five days after he had been killed. After Ali was elected caliph, the first and most important task that lay before him was to find the murderers of Uthman and punish them. However, there was not just one suspect, but rather a large crowd, consisting of as many as a thousand people, all claiming that they had murdered Uthman. It was thus clear that the new caliph would not be able to easily defeat the rebels who in fact had taken the entire city under their complete control. It was a situation in which he thought it prudent to wait for a time. Another possible factor that led him to make this decision was the fact that that only the residents of Medina had taken the oath of allegiance; in other provinces the situation was not so clear, as people did not have good information about what was going on in Medina. Thus, for example, when an envoy was sent to Muawiya, the governor of Syria, who was the nephew of Uthman, to ask him to take the oath of allegiance to Ali, he refused to do so, claiming that Ali had cooperated with the insurgency, thereby implying that he would try to revenge his uncle. In addition, ‘Aisha, the wife of Prophet Muhammad, who had previously supported the opposition against Uthman, now refused to recognize the caliphate of Ali. Moreover, Talha and Zubair joined Aisha four months later. Thus, Ali had to assemble his forces and march toward Basra in order to persuade Talha and Zubair to pledge allegiance to him. Based on our current level of historical information, it is not possible to explain the actual reasons behind the negative attitude of Muawiya, or that of some other Companions who were close to the members of the Umayyad family in Mecca towards the caliph who sincerely wanted to penalize the murderers of Uthman, but was waiting for suitable conditions to do this in. The army led by Aisha confronted the caliph's army in a place called Huraiba near Basra on 15 Jumaada Thani 36 (9 December 656). What is known as the Battle of the Camel was won by Ali; many Muslims, including Talha and Zubair, were killed in this civil war. The caliph was very saddened by this, and he personally took charge of the funeral services for the Muslims who had been killed on both sides. He also sent Aisha to Medina with an envoy of women. After he distributed the weapons recovered from the battlefield as well as the money in the state treasury to his army as booty and took care of those who had rebelled against his caliphate, Ali once again invited Muawiya to take the oath of allegiance for him, but his proposal was once again refused. For this reason, two Muslim armies confronted each other again, this time in Siffin in Dhul-hijja 36 (June 657). The Battle of Siffin lasted about three months, wearing out both sides. It finally ended in the early morning of 9-10 Safar 37 (27-28 July 657), Friday, which is known as layla al-harir -a designation that alludes to the pain and exhaustion of warriors. When the caliph was getting ready to strike the last blow (through his famous commander Malik al-Ashtar) against the army of Muawiya, the latter saw what was coming and decided to run away from the battle field. At that moment ‘Amr ibn al-As, the conqueror of Egypt, saved Muawiya's life by proposing that the two sides should resort to the discretion of the Quran in order to solve the intransigence. Then Muawiya lay the Great Syrian Quran, as a symbolic gesture, onto five spears and had them carried by his commanders; his soldiers also hoisted copies of the Quran that they had on their lances, and chanted "O Iraqis! Let us end this war; and let the Quran be the judge on the problem between us and you!" This gesture made a great impact on the Qurra (those who had memorized and knew the Quran by heart) as ‘Amr had expected. Although the caliph warned his commanders and soldiers that this was fraudulent behavior, he was not able to persuade his followers. He thus had to accept the proposal for arbitration due to the insistence of many of the Qurras in his army. Ali then unwillingly chose Abu Musa al-Ash'ari as his arbitrator and Muawiya selected ‘Amr ibn al-As as his. The two sides then made an agreement on 13 or 17 Safar 37 (31 July or 4 August 657); the condition was that the two arbitrators would make their decision based on the Quran and if necessary the sunnah of the Prophet. Although the two sides agreed on the decision reached by arbitration at the end of the Battle of Siffin, in which about 70 thousand Muslims had been killed, some of the members of the caliph's army, particularly those who were from Tamim, opposed this agreement, chanting the slogan 'La Hukm illa lillah' (the decision belongs to God), and declared both Ali and Muawiya apostates for accepting a law that was not God's. They also asked Ali to repent to Allah for the error he had committed by accepting the arbitration of a human being, and requested that he wage a war against the insurgents until they abide by the orders of Allah, in accordance with the Quran (al-Hujurat 49/9). Ali then told them that although he had reminded them of the order of Allah at the very beginning, they had not listened to him; now, as an agreement had been reached with the other side, he would not breach this agreement, as this too was a principle of the Quran (Al-Nahl, 16/91). Upon receiving this answer from Ali, approximately ten thousand soldiers, most of whom were members of the Tamim tribe, left the army and retreated to a place near Kufa called Harura, instead of returning to Kufa with the caliph. Later the caliph went to Harura to talk to them, after which about six thousand soldiers returned to Kufa with him. The remaining four thousand soldiers, who would later be called the Khawarij (or Kharijites, literally "Those who Go Out"), went to the city of Nahrawan. Meanwhile, the arbitrators met for the first time in Ramadan 37 (February 658) in Dumat al-Djandal, a city located between Syria and Iraq. They first agreed that the policies pursued by Uthman were legitimate and that for this reason those who had killed him did so with no legitimate reason. In the meantime, Ali was gathering his forces together and getting ready for a last attack on Muawiya. He also wrote a letter to Nahrawan to convince the Kharijites who were present there, but this effort failed. Moreover, they traitorously murdered one of the Companions of Prophet Muhammad, Abdullah ibn Habbab, and his pregnant wife merely because the couple did not agree with them. Ali then decided to march towards Damascus only after dealing with the Kharijites by completely finishing them off. Most of the Kharijites were killed in a brutal struggle between the two groups, which took place on 9 Safar 38 (17 July 658). After this war, Ali made a stopover in Nuhayla before marching on to Damascus. In the meantime, he asked the last group of Kharijites, which had stayed in Kufa, who were known as the Ahl al-Nuhayla and numbered about two thousand, to either join his army in its march to Damascus or to return. However, they refused to comply with this proposal and even attacked his army, accusing them of having become infidels (takfir). In the ensuing battle, most of this group was killed with the rest fleeing to Mecca. After all these unfortunate events, Ali's soldiers were too tired to fight another battle, and told him that they did not want to fight anymore. Upon this request, Ali felt obliged to stop his preparations and cancel his plans against Muawiya, and returned to Kufa. On the other hand, when the two arbitrators once again came together in Sha'ban 38 (January 659) after the first meeting in Dumat al-Djandal, they agreed that both Ali ibn Abu Talib and Muawiya ibn Abu Sufyan should be made ineligible for the caliphate, and that the new caliph should be elected by a committee. The decision was first declared by Ali's arbitrator Abu Musa; when it was Muawiya's arbitrator ‘Amr ibn As's turn, he suddenly declared that he had appointed Muawiya to the caliphate! Although Abu Musa objected this declaration, he could not succeed in repealing it. This chaotic situation brought the matter of the caliphate to a dead end, and created a great deal of social and political disorder and unrest in the Muslim world. As a result, there emerged a two-partite power structure, due to the fact that a portion of the public recognized Ali as the caliph, while another portion saw Muawiya as their leader. After the two arbitration meetings, Ali settled in Kufa to prepare for a last battle against Muawiya, but could not get enough support from the Iraqi soldiers, who were not committed enough. Despite this, he was able to gather an army of 40 thousand soldiers and prepare for the campaign. However, one day while he was performing the morning prayer in Kufa, he was badly injured by Abdel-Rahman ibn Muljam, a Kharijite who wanted to take revenge on Ali; he stabbed him with a poisonous dagger. Two days later, on 19 or 21 Ramadan 40 (26 or 28 January 661) he died and was buried in Kufa (today's Najaf) in Iraq. After his death, Muawiya gained the full support of the Muslim population in Syria and invaded and conquered many of the regions that had previously been controlled by Ali, including Egypt; he thus established the Umayyad state in the Middle East. Ali was an intellectual authority among the noble Companions of the Prophet with his deep knowledge of the Quran, hadith (sayings of the Prophet) and particularly fiqh (Islamic jurisprudence). Most of the hadith traditions he narrated were about matters of fiqh, most of which he reported from Abu Bakr, Umar, Mikdad ibn Aswad, and his own wife Fatima, as well as from Prophet Muhammad himself. Moreover, those who reported from Ali himself include first and foremost, his sons Hasan and Hussein, as well as other Companions, such as Abdullah ibn Mas'ud, Abdullah ibn Abbas, Abdullah ibn Umar, Abu Hurayra, Bara ibn Azib, Abu Said al-Khudri etc. In addition to these, there were hadith scholars, such as Muhammad al-Hanafiyya, Abu al-Aswad al-Duali, Abu Wail Shakik ibn Salama, Sha'bi, Abdel-Rahman ibn Abu Layla, and Zir ibn Hubaysh. The number of hadiths that Ali himself narrated is 586. Twenty of these are found both in the compilations of al-Bukhari and Muslim; nine are reported only in al-Bukhari's Sahih and fifteen in Sahih al-Muslim. Due to the fact that Ali spent a lot of time with Prophet Muhammad, many of the hadiths he narrated were about the Prophet's shamaail (his manners and appearance) and his prayers, as well as the way he used to worship. He also had a sheet of paper with several hadiths on it, which he had recorded when he heard them from the Prophet. According to his own account, this sheet, which he used to carry in his scabbard, contained hadiths about such matters as diyat (blood money), the ways in which a Muslim prisoner of war could be saved from the enemy, the rule that a Muslim life could not be given for that of an infidel, as well as the delineation of the borders of the haram (sacred) district within Medina. This sheet was thoroughly analyzed and published by Rifat Fawzi Abdulmuttalib in 1406 (1986) in Cairo. Ali consistently said that he had not received any other directives from Prophet Muhammad and had not written anything else that he had said other than the Quran and this sheet. During his caliphate, in order to ensure the authenticity of the narrated hadiths, Ali used to require that anyone who reported a hadith with a doubtful source take an oath that they had heard the hadith directly from the Prophet himself. He would suggest that only those hadiths that were known by many people should be narrated, rather than wasting time with weak or inauthentic narrations. He also encouraged those who wanted to benefit from his deep knowledge on the Quran to ask him questions, and would say that he knew well where and when the verses were revealed to the Prophet, because he was one of those select Companions who had memorized the Quran when the Prophet was still alive and had been able to gain a deep understanding of its content. Unfortunately, however, very little of his contributions to the interpretation of the Quran (tafsir) have been cited in reliable sources due to the fact that his fanatical supporters have attributed many incorrect and extreme views to him, just as they have done with his views on hadith. Ali ibn Abu Talib also served as the qadi (judge) of Yemen when Prophet Muhammad was still alive. When the Prophet wanted to send Ali to Yemen for this task, after Khalid ibn Walid had fulfilled the post, Ali humbly said that the level of his knowledge in Islam was not high enough to be successful in this position; however, the Prophet reassured him by putting his hand on Ali's chest and telling him that Allah would inspire him with the truth and make him tell the truth all the time, eliminating all his doubts. Then he instructed Ali how to be a good judge. Later when Prophet Muhammad went for his first and last pilgrimage to Mecca, Ali arrived from Yemen and joined him in Mecca. Ali's knowledge of the law and his competence in jurisprudence was acknowledged by Umar, who said: "Ali is the best among us in terms of legal reasoning". For this reason, the first three caliphs always sought his opinions in important legal and political matters. Other Companions also would not ask someone else after Ali had expressed an opinion on a religious question, as they believed that his views would always prove to be right. Although he was one of the most knowledgeable of the Companions, later generations have been reported less information and scholarly opinions from him in comparison to other younger scholarly Companions, such as Ibn Umar or Ibn ‘Abbas. The reason for this is because during his caliphate years Ali had to deal with battles and with suppressing the instigations and upheavals that frequently occurred. Thus, he could not find much time or opportunity to transmit his repertoire of knowledge in tafsir and fiqh to subsequent generations. Other Companions also had the advantage of living a longer life than Ali. Also, it has been reported that Ali established the principles of Arabic grammar; but this report is not reliable. The attribution of the science of jifr (cipher) to him is also a baseless claim. He was also well known for his eloquence and excellence in rhetoric, and many of his aphorisms have been reported in sources. His other more political and religious speeches and letters - which do not have literary quality or manner - were also compiled by the poet and man of letters, Sharif al-Radi (d. 359 / 969). However, whereas the Shiites usually find this report highly reliable, the Sunnis legitimately hesitate about much of its content, and reject some of it on the grounds that it does not belong to Ali. No reliable source ever mentions that Ali wrote a book, nor are these rather dry couplets compatible with his excellent rhetoric and literary taste. 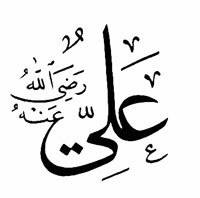 Ali was one of the ten Companions who were promised entrance to Paradise by Prophet Muhammad (also known as the al-ashara al-mubashshara). The reports about his virtues and legends cannot, as Ahmad ibn Hanbal once remarked, be compared with those of other Companions in terms of their number. According to some scholars, some of the Umayyad administrators who were hostile to Ali tried to repress reports about him threatening those who spoke of his virtues; but the fact that many of the Companions of the Prophet spent a great deal of effort to publicize whatever they heard from the Prophet about Ali and every event that they saw as having some relevance to him made it easier for these reports to increase in number. On the other hand, some Shiite groups and others, who desired to abuse Ali's power for political purposes, were not content with the authentic reports about his virtues and personality, but rather fabricated a number of reports about his superiority over the other three caliphs, even when Ali was still alive, which greatly disturbed him. Thus for example, Ibn Abu al-Hadid, a Shiite scholar, has argued that the fabrication of hadiths about virtues was first carried out by some extreme groups within the Shiites, and that many hadiths were fabricated concerning the virtues and superiority of Imam Ali ibn Abu Talib. The majority of the ‘hadiths' fabricated by extreme Shiite factions concerning the virtues of Ali have a nature that is completely incompatible with Islamic principles. Such fabrications include, for example, reports that claim that Ali would return to the world after his death, or how he is not dead but still lives, that he has divine qualities, or that he hides in a cloud or thunderstorms were his voice and lightening flash his whip, or that he would be sent by God as a messenger after Prophet Muhammad. In addition, it is a fact that the Prophet could not possibly say some of the things that it is claimed that he said, such as the Prophet and Ali were created from the same light (nour), that the angels prayed for them for seven years, and that those who deny that Ali is the best of creation would lose their faith and become infidels, and many more of this kind. Other reports on the virtues of Ali include those that were not fabricated - as in the case of above-mentioned ones - but are considered by most hadith scholars to be weak. One example includes the following narrative: One day Prophet Muhammad was presented with a fried chicken by his Companions. He then prayed to Allah saying "O Allah! Send me your most beloved servant to share this with me now." Then Ali came over, and they ate it together. In other variants of the reported hadith, it is noted that either Aisha or Anas ibn Malik tried to prevent Ali from getting in although he had come to the door, since they wanted one of their own relatives to have this honor; however, in the end, they had to let him in. Many hadith scholars, such as Thirmidhi, remark that this hadith is weak. On the other hand, there are also some sahih (authentic) hadiths regarding the virtues of Ali. The extremist Shiite groups, however, are not content with the authentic forms of these reports, but often make amendments to them, particularly in order to support their claim that it was Ali ibn Abu Talib who should have been the first caliph. One of the most reliable and authentic reports regarding Ali's virtues is the following: Prophet Muhammad is reported to have said during the Battle of Khaybar that he would give the flag to someone who loved Allah and his Messenger the next day and that victory would be won by this person. Many Companions became excited at this promise, including even Umar ibn Khattab. However, Prophet Muhammad gave the flag to Ali, who then led the conquest of Khaybar. Another authentic hadith reports the Prophet as having said that only the believers would like Ali ibn Abu Talib, and only the munafiqs (religious hypocrites) would hate him. It is only natural that Prophet Muhammad loved Ali so much and paid him compliments in a way that he did not do for other Companions; he was one of first persons to believe the Prophet and enter Islam, he was raised by the Prophet in his own house and under his protection, and he always supported the Prophet, even in times of despair. Moreover, he was both the Prophet's cousin and his son-in-law. Thus, all these reports indicate that Ali was a virtuous and great Companion; however, they do not overshadow the virtues and superiority of the other great Companions, such as Abu Bakr, Umar and Uthman, who were themselves close friends of the Prophet and praised by him in different ways. Even the authentic reports about Ali do not disturb the hierarchy, particularly regarding the question of the caliphate. Finally, it should be noted that the desire to compile the existing reports on the virtues of Ali has, since the early centuries of Islam, led many scholars, both Shiite and Sunni, to produce works in this field; accordingly, there has emerged a huge literature consisting of different studies on the virtues and characteristics of Ali, including his heroic actions in different expeditions and battles. This article is an abridged version of the article titled ¨Ali¨ by Dr. Ethem Ruhi Fığlalı and Dr. M. Yaşar Kandemir, in DIA, III, İstanbul. Please type '251' into this field. Who conducted the Prophet's first marriage ceremony? Which Names did the Prophet Change?